East Yorkshire rally driver Becky Kirvan had a dramatic end to the Trackrod Challenge rally last weekend when brake failure resulted in her car flying off the road into a tree, putting her out of the event. With the organisers of the Rally Isle of Man announcing that their event had been cancelled the Trackrod became the last round of Becky's BRC Challenge season so she was especially keen to get a good result on her home event. The event started with stages in Gale Rigg and Cropton forests north of Pickering. Becky and co-driver Kaz Watts made a good start in their KC, Bardahl Top Oils, Princes Quay Shopping Centre, Peart Auto Services, Rally4Real and Songasport-supported Ford Fiesta ST to lie in 11th overall and 2nd in class. However, the opening two stages were not without problems with the car's brake bias needing altering after the first stage and then the brakes overheating when braking at the end of the many long straights in the second stage. "The car was getting out of shape a lot under braking in the first stage so I adjusted the brake bias ready for stage two," commented Becky. "This seemed to help the handling in the second stage but then we had the overheating issue which caused some anxious moments when slowing from the high speeds we were doing on the straights." 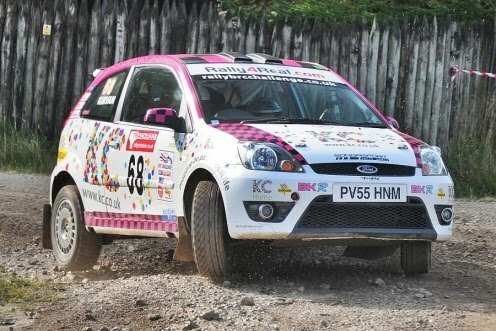 Stage three took place in Staindale forest and Becky had another good run to maintain her 11th overall and 2nd in class. With the long Langdale stage next Becky was keen to push on and aim for the top ten but it all went wrong a couple of miles from the end of the stage. The stage was another with lots of long straights and Becky again had to battle overheating brakes but coming up to a right-hand bend the brakes totally failed. Although she attempted to turn the car on the handbrake it was going too quickly and flew off the road. The roof of the car hit a tree and it then landed upside-down with the crew initially trapped inside. Fortunately they were able to extract themselves and they were not badly hurt although as a precaution Kaz was taken to hospital to be checked over. "It was a pretty high-speed accident and the roof took a lot of the impact on Kaz's side of the car though we were well protected by the roll cage. It was a little scary being trapped upside down but we got out eventually. It was a very disappointing way to end our BRC Challenge season but at least neither of us were seriously injured. I'd like to sincerely thank EMMU rescue for attending to Kaz and myself and also Lakes 3 and Difflock 8 recovery crews for extracting the car, it was a very professional job by them all. The car needs a new roof and door pillar and a few other parts but it will soon be back to full health." Despite the retirement on the final round Becky ends the season in second place in the RC5 class championship and she is also the BRC Challenge Ladies Champion. Becky's next planned event is the Wales Rally GB world championship round but she is hoping to contest another event before this once the car is fixed. Please visit www.beckykirvan.co.uk or join the Facebook group at www.facebook.com/BeckyKirvanRallying for all the latest news and pictures.